Lufthansa FC is a very expensive product. 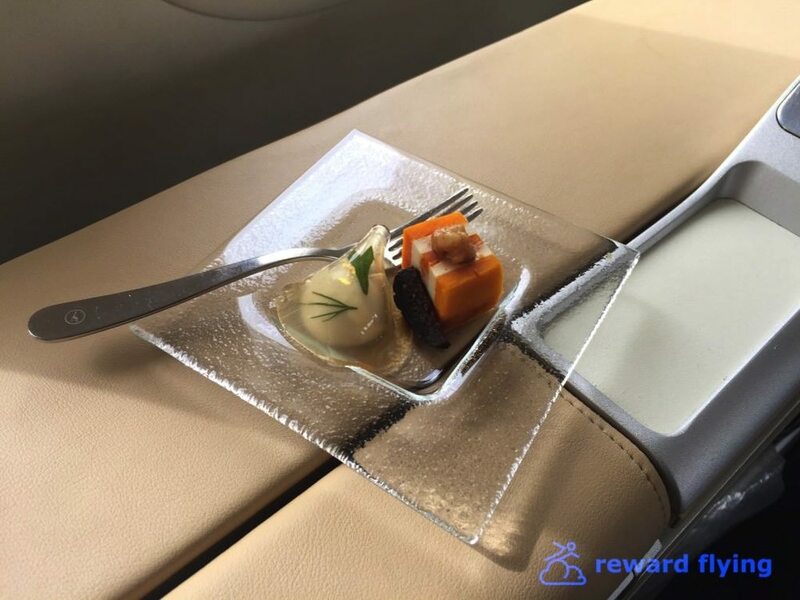 For most of us, reward redemption is the only way to ever fly it. The HND-FRA route retails at around $16,000. To HND the cabin was full, returning it was just me. First Class has 8 seats on the lower deck. Each seat has an ottoman and a storage locker that wouldn’t fit my carry-on. I’m guessing the locker is about 14x32. It has a hanger and is deep, just not wide. Typical 747 layout with 1-1 on the windows and a row of 2 seats in the middle behind the serving counter. Lufthansa has 1 of these rows. Cabin was ultra clean (until I spilled a glass of wine) as were the lavatories. The two lavatories for First Class were good size but not huge. Given I was the only one in First Class on two of my flights, waiting was not an issue! You could sit in these seats for days. The seats are wide with good support. The foot rest is an ottoman which is controlled by the seat electronics. They are so big you have a shoulder strap that must be worn on take-off and landing. And notice the amount of leg room this seat provides. You can’t reach the ottoman with your belt fastened. It might just be me on planes but I didn’t find the bed very comfortable. The bedding was nice, the pillows small, but the mattress pad didn’t seem to offer much comfort from the sturdiness of the seat. While the FC cabin is open, each seat has a privacy screen which encloses the sleeping area. With this screen extended the seat/bed becomes very private and the bed itself is quite large. So my issue was simply with comfort. Pajamas along with a toiletry kit and some really uncomfortable slippers. The kit included a comb/brush, toothbrush/paste, socks, ear plugs, eye mask and some creams. Interestingly no mouthwash which was available in the lavatory. But the pajamas are worth the price of admission, they’re made by VanLaack. I wear them everyday! Of course they have champagne, but not being a big fan I did not get the brand. The fresh macadamias were excellent as you can tell from the empty bowl in this photo. The wine selection was good. A total of eight wines were offered. 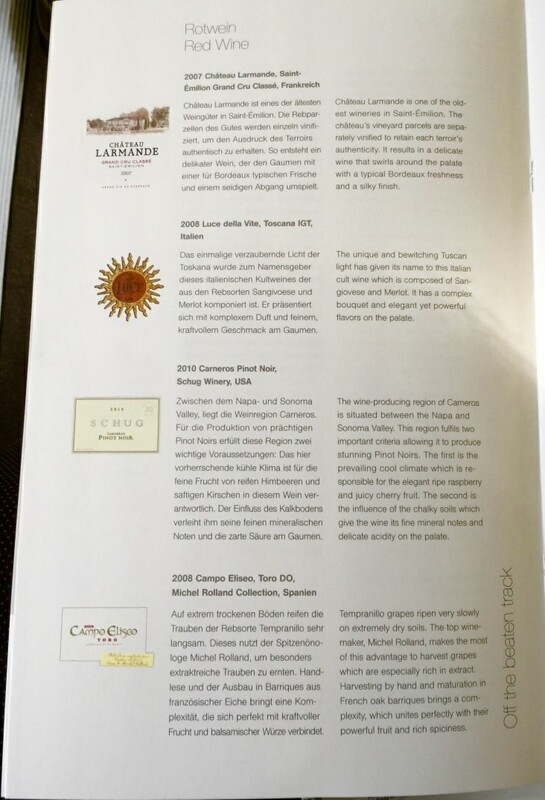 I enjoyed a 2007 Chateau Larmande, Saint-Emilion Grand Cru Classe, multiple times. 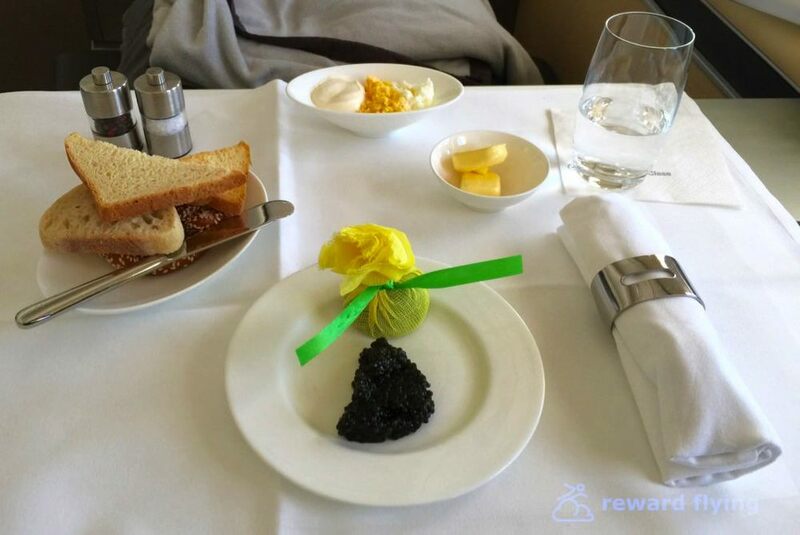 Amuse Bouche, caviar, multiple appetizers brought on trays to select, main course consisting of one international menu with 2-3 items to select from and on the Japan route an additional 2-3 Japanese choices, cheese and desert. Chocolate and mid flight snacks. Breakfast had 2 choices as well. I’m sure you can pre-order special meals however I did not look into this. Presentations were made with great care. The food for the most part was very good, especially the freshly scrambled eggs with crispy bacon, and I don’t even like bacon. The Japanese offerings were exceptionally good as well, presented in traditional multi-small serve tastings. It was the Western meat dishes that were just ok. 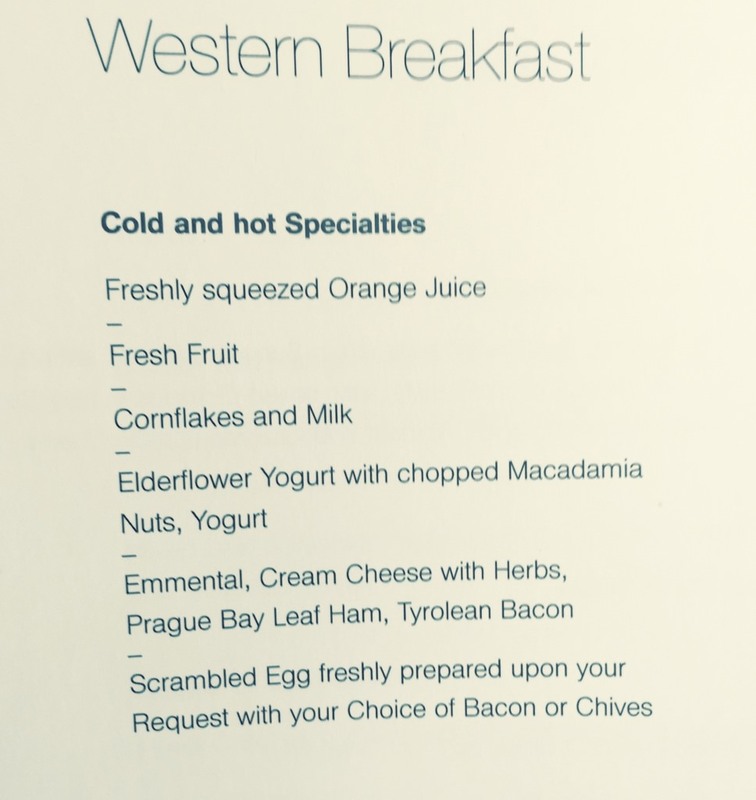 The European style muesli was particularly good. The equipment was fine with the typical German hard to navigate functionality (at least from my experiences using German technology in their cars.). Bose headphones are hardwired in a compartment next to the seat. Video controller is in the armrest. It’s the content and Airshow that were disappointing. Very few movies. Airshow that essential showed a picture of the plane over terrain that had very few land markings and little in the way of flight information. Much of it was in German. I wrote Lufthansa to complement my flight crews. They were attentive without being intrusive along with being friendly and polite. The Purser visited after take off and before arrival. Excellent crews on all 4 flights. These were all Boeing 747-8i series. Tail numbers were ABYT, ABYH, ABYM and ABYM. ABYT was 4 months old and the others less than 2 years old. ABYT was painted in their Retro Livery. The quietest plane I have ever been on (787 included). A departure video is posted below, hear for yourself. Also the smoothest aircraft I ever been on. Very little turbulence felt and FC is in the nose. I hope this plane catches on with other airlines as it is an incredible airplane. Recently updated the app appears to be much more functional that back in August 2015 when I used it. Then it was really only useful for checking flight status, checking in and getting electronic boarding passes. Now you can book flights and manage existing flights including changing seats. 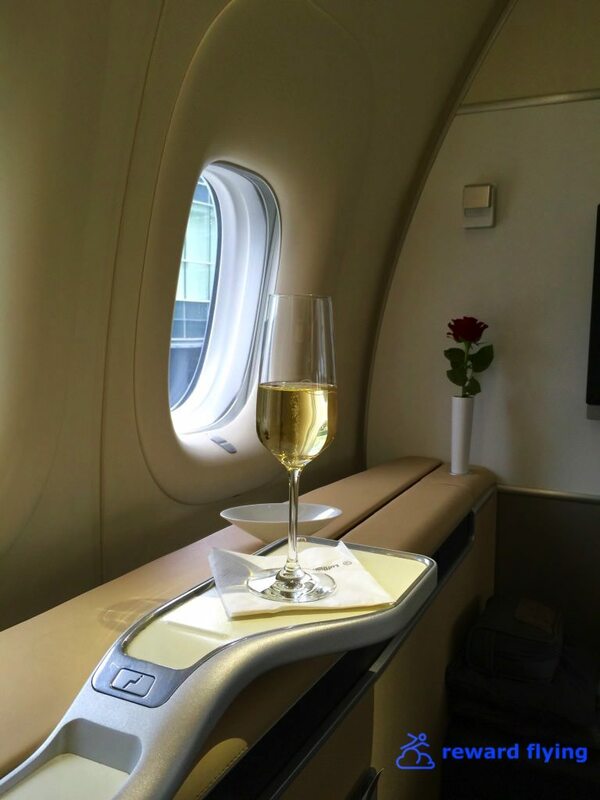 I was fortunate to have experienced Lufthansa First Class 4 times from ORD-FRA-HND and back. About 20,524 air miles. That along with the Frankfurt lounges made for a once in a lifetime experience. The retail fare for these flights is over $38,000.00. Total cost was 330,000 United points plus some change fees. And with some better planning on my behalf this trip could have only cost 220,000 points. But still I got a 11.5 cent per point redemption value. If you get the opportunity to fly Lufthansa FC do it.